Simulation of fluids with complex rheology is an important aid in many industrial applications such as sealing spray, adhesive application, food dispensing and drop-on-demand (DOD) jet printing. FCC has dedicated research activities into this area to further expand our simulation technologies. Our flow solver IPS IBOFlow provides support for various types of non-Newtonian behavior such as shear rate dependency, thixotropy and Bingham plasticity. Droplet formation of a mixture of ethylene glycol and water. The filament breaks up and forms a satellite droplet that later coalesces with the main droplet. Everything flows. Rheology is defined as the study of deformation and flow of matter. Since this description essentially fits all fluid and solid mechanics it is convenient to exclude all purely elastic and purely viscous materials from the scope of complex rheology. Fluids with complex rheology have a microstructure that in some way responds to deformation or possesses some combination of elastic and viscous behavior. This results in a stress tensor that cannot simply be described as a linear function of the strain rate but involves nonlinearity and possibly time dependency. Conventional Newtonian simulation techniques are therefore not sufficient for these kinds of fluids. To overcome this issue, IPS IBOFlow is equipped with several non-Newtonian models where the apparent viscosity varies non-linearly with the rate of deformation. The models are complemented with an equation describing the build-up and breakdown of the microstructure in order to include time dependent thixotropic effects. Additionally, the Volume-of-fluids module in IPS IBOFlow includes models for simulating granular suspensions in a two-fluid, Euler-Euler framework. 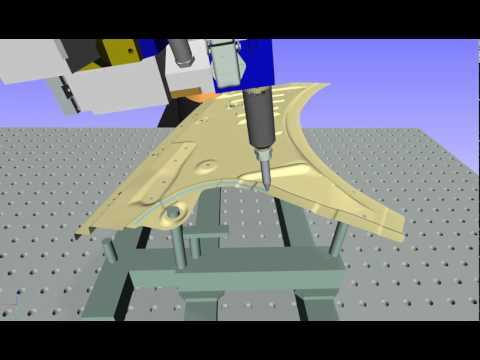 Within the project The Virtual Paint Shop viscosity models for sealing sprays has been developed and integrated in the software IPS Virtual Paint – Sealing. Other projects within the field of complex rheology involve simulations of adhesive application and, together with Mycronic AB, jet printing of a granular solder suspension.